Try to imagine Congressman Emanuel Cleaver, former mayor of Kansas City, chairman of the Congressional Black Caucus, Methodist minister, standing in a Saline County cornfield talking knowledgeably to farmers about this year’s crop and about national agriculture policy. Imagine a native of Marshall, Missouri having a good understanding of the problems facing Missouri’s largest city. The people who have drawn proposed new congressional districts have that kind of imagination. Their new fifth congressional district includes Kansas City and then connects with a scrawny neck to the rural body of the district—Ray, Lafayette, and Saline Counties. Missouri’s proposed new fifth district, which is almost the same on proposed maps from the House and the Senate redistricting committees, has raised a number of eyebrows, especially in the three rural counties. We’ve been told the folks in Saline County are highly perturbed, to say the least. They don’t see that highly-rural Saline County has anything in common with Cleaver’s Kansas City. And folks in the other two rural counties, we’ve been told, are also pretty agitated. 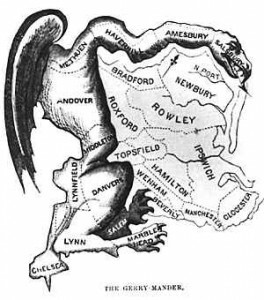 The new fifth district doesn’t look so much like a salamander as it does a dead lizard. We thank daughter and Columbia graphic artist Sara Priddy for her contribution to the discussion. Some other people not in the legislature have come up with their own proposed maps that keep Kansas City in its own district and leaves the three rural counties in rural districts. If the redistricting bill is debated today in the Senate, look for some alternatives to be proposed. The legislature has to approve the new districts and the governor has to sign the bill–or veto it. House leaders think they have the votes to override a veto. The next question would be whether somebody would be aggrieved enough to file a lawsuit. It has happened in the past. While all of this is going on, however, it might be a good idea for Rev. Cleaver to start scouting around for some Big Smith bib overalls, a Pioneer Seed Corn Cap, and some work boots that are comfortable to wear when you’re standing in the middle of a corn field or a bean field, a pasture or a feedlot. And Saline Countians might start learning about inner city schools, mass transit, and how to get grants to set up a big entertainment district in downtown Marshall.